Last year’s defeated cup finalist, EB/Streymur, had an easy game in their first round match against 3rd tier team Giza/Hoyvík. The hosts showed real hospitality when they gave EB/Streymur the lead with an owngoal after 10 minutes. Giza/Hoyvík then held tight until midfielder Pætur Dam Jacobsen doubled the lead on the half-hour. Only two goals behind at halftime looked like a fine scoreline for the lower ranked, but ten minutes after the break the floodgates opened and EB/Streymur scored four goals in six minutes. Then there was quiet for 15 minutes before EB/Streymur went at it again and scored three more goals in the last quarter of an hour where also Hoyvík/Giza grabbed a consolation goal on penalty. Although a pleasant result for the cup specialists of EB/Streymur, there has been plenty of bad news also as they learned that striker Arnbjørn Hansen will be out for about 5 weeks after suffering a knee ligament injury towards the end of the league game against KÍ Klaksvík last Wednesday. Also midfielder Brian Olsen has suffered a similar injury in that same match and will be out for similarly length of time. Olsen was one of Brian Kerr’s darlings, but Olsen found it difficult making the (EB/Streymur) team last season and therefore went on loan to 07 Vestur in the second half of the season. For today’s match, also Marni Djurhuus pulled out before the match with a hamstring injury. On the positive side is that goalkeeper René Tórgarð has returned to action and so has forward Gunnar Zachariasen after serving a 3-match suspension. 1st division promotion-hopefuls FC Suðuroy looked to have secured progress to the quarter-finals when they went 2-0 up against 3rd tier team Undrið FF just before the hour-mark, but when Erling Fles pulled a goal back few minutes later, Suðuroy’s ride became a bit uncomfortable in the last half and hour, but they managed to hold on to the slender lead, however. B36 are still hard hit by injuries and are just not the team they opened the season with when they beat Víkingur 4-0 in the second round of the league. Víkingur were in control for the most of the match, well helped by an owngoal within three minutes of the start when Danish defender Martin Pedersen headed behind his own goalkeeper from a corner. Víkingur doubled their lead after 35 minutes when fillip Djordjevic made the heavy lifting to set up Finnur Justinussen for an easy finish. Apart from Súni Olsen’s thunderous shot on the crossbar from 30 metres and where Rasmus Dan Sørensen should have put away the rebound midway through the second half, B36 rarely threatened and it didn’t help the cause that Olsen was shown the red card shortly after his attempt. Only in the last 10 minutes did B36 manage to put any kind of pressure on Víkingur which paid dividend when Ámund Nolsøe scored from a corner. But although decent attempts in stoppage time, it was a little too late for B36 to force extra time against the current cup holders. AB’s injury list grew from 8 to 9 when Leivur Holm was carried off and into the ambulance before half an hour had gone, but before that ÍF had taken the lead through Øssur Dalbúð. AB restored parity before the hour-mark when Hørður Mohr rifled past Hallgrím Hansen who deputised for Jákup Mikkelsen, but ÍF scored the winning goal with 2-0 minutes remaining when Ari Ellingsgaard stretched to poke home. Although TB had a slight edge during the first half, it was NSÍ who took the lead five minutes before half-time through Árni Frederiksberg before Jann Martin Mortensen booked the quarter-final spot with NSÍ’s second goal with 20 minutes remaining. Although NSÍ had defender Einar Hansen sent off for two yellow cards with 10 minutes remaining, it had no influence on the game or the result. Giant killer is probably too big a word, but it must be considered a surprise that 1st division side Skála knocked out premier division side 07 vestur, even if 07 Vestur are newly promoted and Skála for long challenged for a promotion-spot last season. Skála took the lead shortly after half time, but were cancelled out when Holgar Durhuus headed in a rebound off the crossbar. But the joy lasted only a couple of minutes for 07 Vestur, as Ólavur Mikkelsen scored a spectacular goal from long distance to send Skála through to the quarter-finals. The difference between a premier division top team and a 1st division top team is too big that B68 were ever going to give KÍ real problems. KÍ’s superiority paid dividend after some 30 minutes when they were awarded a spot kick which Atli Danielsen safely converted before Heðin á lakjunui few minutes later doubled the score directly from a free kick. Álvur Christiansen made it 3-0 late in the second half. B71, struggling in the 1st division, were never going to give HB any problems, but managed to get away with a respectable result, however. Christian R. Moursitsen opened the scoring for HB after a quarter of an hour as he had been set up by younger brother Kristin R. Mouritsen. B71 were reduced to 10 men on the half-hour when Áslakkur Kjærbo was sent off after a second bookable offence. Johan Troest Davidsen then made it 2-0 before Bárður Heinesen on the stroke of half-time made it 3-0 with his first goal for HB. Magnus Egilsson, who had come off the bench on the hour-mark, made it 4-0 ten minutes after the substitution with his first goal for HB’s seniors. Páll Holm Jacobsen pulled a goal back for B71 late in the game before Kristin R. Mouristsen made it 5-1. Between the posts, HB had given Hans Jørgensen – who played for EB/Streymur on Wednesday on loan – the chance to play today to “keep him warm”, so to speak. Very little separate HB’s first and second choice, where Teitur Gestsson so far has had the first choice title, and likely will be in that position again when HB take on Víkingur next Sunday. EB/Streymur could be on their way to a 7th cup final in succession after beating HB Tórshavn on penalties to reach the semi-finals. After an even first 20 minutes of the match, HB eventually got the upper had, but EB/Streymur always seemed capable of scoring on the counter however. EB/Streymur goalkeeper René Tórgarð had been the busier of the goalkeepers in the first half, but just before half-time, attacking midfielder Gunnar Zachariassen went very close for EB/Streymur with a fierce diagonal shot from just outside the corner of the penalty area which nearly crept into the top far corner. Right after, and with the last kick of the first half, EB/Streymur survived the scare when Fróði Benjaminsen stretched to poke the ball on the crossbar. HB again had more of the possession in the second half and put a sustained pressure on EB/Streymur in the early minutes where Heini Vatnsdal headed on the crossbar from a corner. But EB/Streymur always looked dangerous on the break, and before the hour-mark EB/Streymur had the best opportunity of the match when Gert Hansen played Zachariassen completely clear, but Hans Jørgensen in the HB goal made an outstanding block to keep the visitors at bay. (Jørgensen is normally second choice goalkeeper, but has been playing the cup games however, and also played one match for EB/Streymur in the league on loan, when Tórgarð was injured. There is little to choose between HB’s goalkeepers, Jørgensen and Teitur Gestsson. – Good for HB with two great goalkeepers, but both are too good to be benchwarmers). Five minutes before the end of normal time, Christian R. Mouritsen hit the near post directly from a corner, and when he received the ball again, the cross slid off the front side of the crossbar before EB/Streymur managed to clear the to safety. HB continued to have possession in extra time, but towards the end of the first period, Zachariassen had a clear sight of goal inside the penalty area, but he blasted the ball over the crossbar. EB/Streymur had another fine opportunity in the second period of extra time, but Jørgensen made another excellent save. At the other end Tórgarð had to be alert several times and made a super save to deny Bárður Heinesen’s curling shot aimed at the far corner. But it remained goalless – in an unusually entertaining goalless game – and penalties were waiting. After EB/Streymur had scored on their first four attempts, Tróndur Jensen, who had come off the bench in extra time, fired his shot on the crossbar to give EB/Streymur match ball with their fifth penalty which Niels Pauli Danielsen converted safely to take EB/Streymur to the semi-finals. EB/Streymur have been in the cup final six times in succession, so who will be brave enough to bet against them reaching it for the seventh time? HB have not been in the final since 2007 when they lost 4-3 against – EB/Streymur; their first ever final and which they have been part of ever since; winning it four times. HB haven’t won the cup since 2004. Although a half-time score of 2-1 could indicate an even match, there had been one way traffic until FC Suðuroy pulled a goal back five minutes before half time. Víkingur had taken the lead through André Olsen after just three minutes, and midway through the half, Finnur Justinussen doubled Víkingur’s lead before FC Suðuroy captain Palli Augustinussen pulled a goal back to give the visitors some hope. 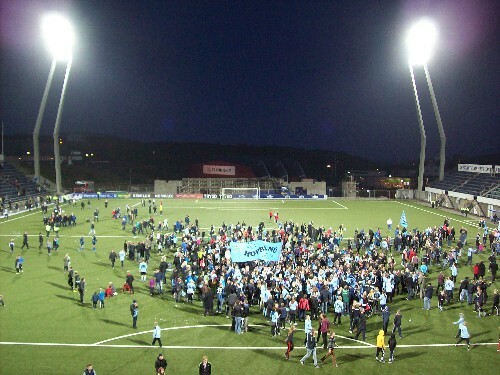 It was a bit tense in the opening minutes of the second half, but when Justinussen restored Víkingur’s two-goal cushion just after the hour-mark, the nerves were settled again, and eight minutes from time, Justinussen completed his hat-trick to send cup holders Víkingur through to the semi-finals. 1st division team Skála, who had ousted premier division team 07 Vestur in the previous round, were never close to making another upset against NSÍ Runavík had an effort on the post early on before they took the lead midway through the half when Andras Frederiksberg from a corner scored against his former team-mates. Klæmint Olsen doubled NSÍ’s advantage shortly before the break following another corner. Árni Frederiksberg cemented NSÍ's semi-final birth in the 73rd minute with a shot from the edge of the penalty area. An even match where KÍ was the better team in the first half and ÍF in the second. KÍ scored what proved to be the winning goal a minute before half time when Álvur Christiansen was played clear and unselfishly played Páll Klettskarð to make the easy finish. ÍF dominated in the second half, but failed to penetrate KÍ’s defence, but were mighty close when they hit the post. EB/Streymur took the lead against the run of play after half an hour when Hans Pauli Samuelsen set up Leif Niclasen to score from close range. The home team had then wasted two or three big opportunities in the opening ten minutes- the closest was a shot from Heðin á Lakjuni on the inside of the upright. The second half was a more even affair where KÍ equalized within ten minutes of the restart through central defender Jógvan Isaksen who had started the attack himself before continuing forward to slot home after the cross from Kristoffur Jakobsen. Víkingur dominated proceedings in the first half and accordingly went ahead just before the half-hour mark with a fine shot from Hans Jørgen Djurhuus. However, NSÍ drew level five minutes before the break with a header from Klæmint Olsen from a free kick. And before ten minutes had gone of the second half, NSÍ had scored again to take the lead through centre-back Pól Jóhannus Justinussen from a corner. Víkingur then equalized after some 70 minutes when Hanus Jacobsen – one of the smallest guys on the pitch – headed in from a free kick. It spurred Víkingur on who scored the vinning goal just three minutes later when Finnur Justinussen played Kaj Leo í Bartalsstovu clear to make it 3-2. The 2nd leg of the semi-finals will not be played before 7 August, after the transfer window has been opened. In the end, EB/Streymur rode their luck, but everything is as usual as EB/Streymur qualified for their seventh cup final in succession as they edge past KÍ to get a 2-1 win in the second leg of the semi-final of the cup competition to win 3-2 in aggregate. EB/Streymur took the lead on the half-hour mark when Arnbjørn Hansen slotted home from close range after a cross from his elder brother Gert Hansen. And when central defender Dánjal Davidsen headed EB/Streymur 2-0 in front from a corner on the stroke of half time, it looked like cup-business as usual for EB/Streymur, as they had a 1-1 draw from the first leg. However, KÍ got back into the tie ten minutes through the second half when defender Sørmund Kalsø headed home via the post. With the away goals-rule, 2-2 would now be enough for KÍ and they got mighty close with five minutes remaining, but the shot that was heading for goal was blocked by a KÍ player! The minute after, EB/Streymur could have decided the tie with a penalty, but KÍ goalkeeper Meinhardt Joensen saved Arnbjørn Hansen’s poor effort. KÍ continued to put pressure on EB/Streymur in the final minutes, but EB/Streymur just managed to hold on to their slender lead to qualify for their seventh cup final in a row. Víkingur went on final-course after 40 minutes after right back Bárður J. Hansen was played clear to an easy finish from a cross from the left. Víkingur dominated for long periods of the game, but three minutes from the end of normal time, NSÍ were given a life-line when the referee awarded them a penalty as he spotted an infringement in connection with a cross, and Klæmint Olsen safely converted from the spot. Having lost the first leg 3-2 on away soil, NSÍ now only needed another goal to claim a place in the final , and it was also close in the dying moments, but Olsen’s header was right on Víkingur goalkeeper Geza Turi. This will be Víkingur’s thirst cup final since 2009, and so far they have won all of their finals – on both occasions against EB/Streymur. Will they repeat that feat again this year? Find out on 24 August! In a repeat of last year’s cup final, it was again Víkingur that came out victorious, winning their third final in the club’s only six years of existence since the merger of GÍ Gøta and LÍF Leirvík. Remarkably, all of their triumphs have been against EB/Streymur who had reached their seventh final in a row, having lost only to Víkingur – now for the third time. EB/Streymur’s gamble with Arnbjørn Hansen’s fitness almost paid off after four minutes when he rattled the crossbar from inside the penalty area, but had to pay a high price just four minutes later when Hansen pulled his hamstring which will also keep him out of the upcoming world cup qualifiers against Kazakhstan and Germany. Instead it was Víkingur who took the lead after 14 minutes when Filip Djordjevic got to the byline inside the penalty area and made the cutback to Finnur Justinussen who slotted home with the goal at his mercy. Víkingur doubled their lead just five minutes later with a shot in off the crossbar from Sølvi Vatnhamar just inside the penalty area. Víkingur were closer to increasing their lead during the rest of the half, but just before half time whistle, Víkingur goalkeeper Geza Turid made a reflex save to deny Hans Pauli Samuelsen from pulling a goal back. EB/Streymur had much of the possession during the second half but failed to create clear-cut scoring opportunities, and although EB/Streymur managed to put some pressure on Víkingur in the final minutes, it was mostly from crosses, which Víkingur had no problems in clearing, and otherwise from the distance which didn’t cause the Víkingur goalkeeper any problems.